Our Church building serves the people of Hanover as a House of Worship, Education and shared fellowship. In addition, we provide a gathering place for other groups and organizations, including the Licking Valley Lions Club, TOPS Club and the Licking Valley Seniors. The Church facilities are available for rent by permission of the Session. For additional information, please contact the Church office at (740)763-2619. 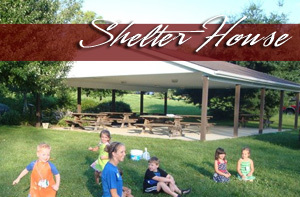 Our Church property also includes a shelter house, peace garden, outdoor chapel and play ground. Constructed in the late 1990’s, the shelter house and surrounding peace garden were dedicated in memory of longtime member, Kathy Callaghan. The outdoor chapel and stone altar were constructed in the early 1990’s and have been used for Easter Sunrise Service and outdoor worship. 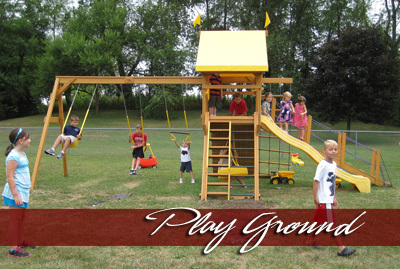 In 2012, a new play set and bench were dedicated in memory of longtime member, John Deeds.